Things Can Go South Fast! 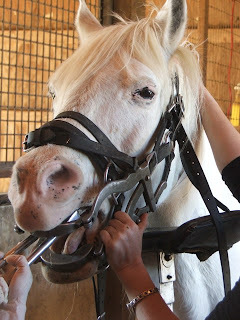 We're going to preach a little - again - on the importance of frequent dental exams in Equine Elders. Twice a year is recommended, more often is not overdoing it if your horse is prone to dental problems. As an example, Freddy, our self-cleaning dancing Arab gelding was examined seven months ago. With no major problems, he had a few sharp edges and points addressed, with everything functioning pretty well afterward. He dropped a few quids here and there if given coarse hay, but that was not new, and not alarming at the age of 26. However....a few days ago, we noticed Freddy having noticeable problems chewing. He had no other obvious sypmtoms, but since the dentist/vet team was in the area this weekend, we asked them to stop by and take a peek. On the initial exam, it was noted that Freddy had a bit of a "fat face." Not any one lump, bump or swelling, just sort of puffy all over. A quick look at his teeth didn't bring up anything obvious, except that he seemed to be biting his cheeks because of the edema in the tissues. Next up: x-rays. And there is was. A tooth infection that had moved into his sinus. Alarmingly, three other teeth looked like they were headed in the same direction. They had to come out. 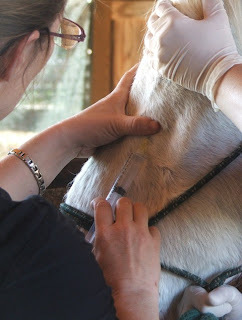 Here, Freddy receives a "nerve block," both to keep him comfortable during the extraction and to prepare for flushing the sinus to knock out the infection. The tooth causing the biggest problem is removed first. Because there was very little of the roots left, all four teeth came out easily, with little discomfort to the patient. 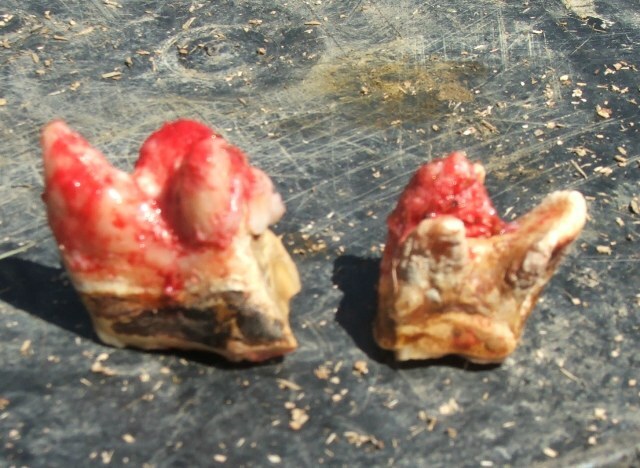 Here are two of the four teeth removed. The larger tooth on the left was the one causing the sinus infection. Next, the sinus cavity itself was flushed out, to be followed up with two weeks of antibiotics. With that, Freddy should be good as new! He may have fewer teeth, but he'll have fewer health problems and less discomfort as well. Infections, abscesses and dental-related sinus problems are not at all uncommon in older horses. Nip them in the bud. Watch for any signs of chewing difficulty, and schedule exams earlier rather than later.